If you’ve ever need something to refresh you body and skin, try this Aloe vera salad recipe. 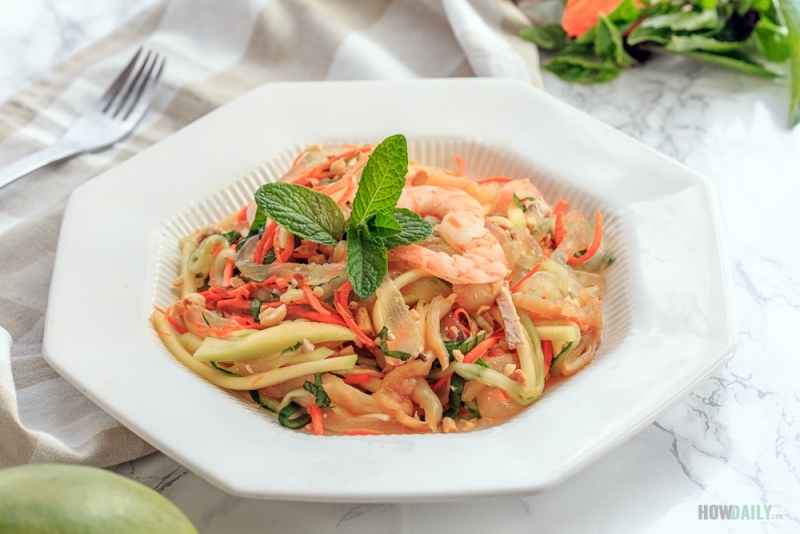 This creation incorporate the ever miracle beauty ingredient “Aloe Vera” with a little twist over your typical salad to bring you on a new adventure to tropical paradise. 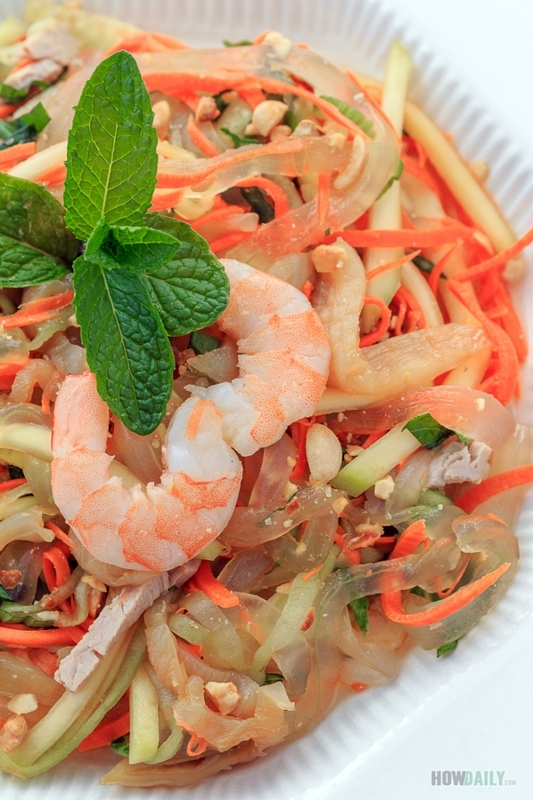 Mango, Shrimp, Jellyfish are all the crunchy fun that make you feel actually in the climate yourself. 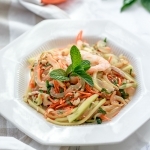 This Aloe Vera salad is an inspired over several oriental salad, as it uses Jellyfish, a popular ingredient oversea, but probably not here in the state. You can find Jellyfish, salted or not, being sold at any Oriental market, be it small or large. My local Meijer carry Jellyfish (body) in brine foiled package. These salted type needed to be soak 1-3 hours and repeated rinse to remove all the saltiness. Another thing is sesame oil, yes, any Jellyfish will need some amount of sesame oil to season for full capacity. On the other hand, you could also substitute with extra Shrimps if you don’t want to get your hand on those Jellyfish. Aloe Vera can be found at any grocery store. Pick the large green one with giant thorn. When handling, remember to remove any color-ish gel (yellow, slimy green) to prevent poisonous. Also, do not consume more than 10g of Alove Vera a day, due to its extreme fiber value, may lead to unwanted side effect. Otherwise, go ahead and dig in, this salad will be so good that you might want to make again the next day. Refreshing salad for that hot summer day, this aloe vera salad offer a new fun way to tropical paradise with exotic flavors. Try it with shrimp and jelly fish. Read the label to see whether it's salted or not. If it is, rinse twice, then soak in cold water for 2-3 hour to release all the saltiness. Rinse once more and let dry. Prepare an icy cold bath, bring a quart of water to boil. Blanch the Jellyfish in boiled water for 2 second, and immediately transfer them to icy cold bath. After 5-10 minutes, remove from the icy bath, strain off excess water. Marinate with 1 Tbsp of sesame oil and 1/2 tsp ground pepper. Cover and place in fridge until final mixing step. Peel off the skin, wash and remove all the yellowish/greenish gel. Cut into long thin strips, about the size of a chopstick. In a large container, add 1 Tbsp of salt and Aloe Vera strip, mix, fold, and squeeze through them all real good, before rinsing to remove all the slimy stuff. Prepare an icy cold bath, squeeze 1 lime (for juice), throw the lime shell in the icy bath too. Boil a pot of water, blanch Aloe vera strips for 2 minutes and transfer to the lime juice-icy-bath. This will help keep the Aloe vera from staining and crunch. Shrimp: boil or steam, remove shell, de-vein and cut into halves. 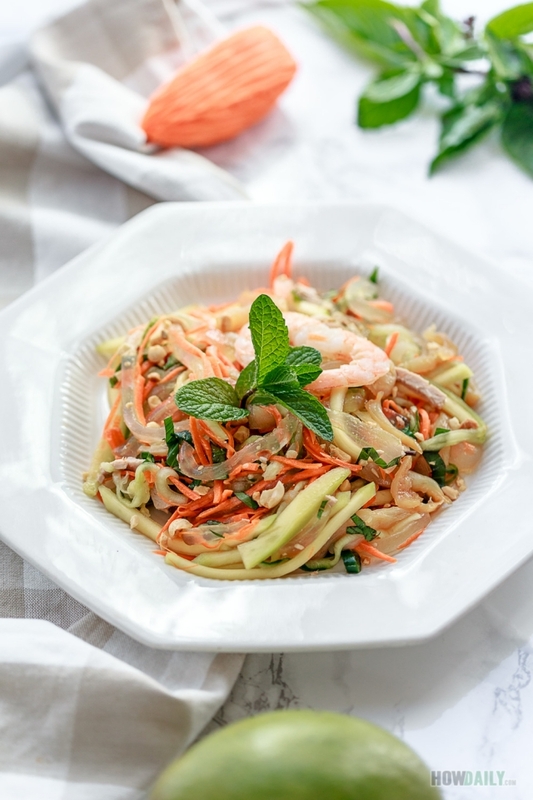 Carrot, cucumber: thinly slice into long thin strips or work them through a julienne spiralizer into noodle strands. Mango: shred or french fry cut. Mint or Basil: remove stems, chop all the leaves. Get a large mixable container to start with the dressing. Add 2-3 Tbsp of sugar (depend on your sweet tooth), 4 Tbsp rice vinegar and 2 Tbsp fish sauce (or 1/2 Tbsp salt). Mix well to dissolve sugar. Test taste and adjust, so that the sauce is sweet and sour with a bit of saltiness to level. Then add (in order) crushed and mince garlic, marinated Jellyfish, shrimp, mango, carrot, and cucumber. Mix them real good(but be gentle and don't break the veggies strands) and let the flavor soaked in for 5 minutes. Finally, add all the minced herbs, cilantro and mix them again. Serve cold with some roasted sesame/crushed peanut sprinkling on top. Best with cracker & crispy chips. Leftover can be stored in fridge for 2 days.